For when you can't go to Mendl's Bakery (because it's fictional). Ever watch a Wes Anderson movie and wish that you could teleport into that ultra-symmetrical, pastel-toned world? Well, that technology hasn't actually been invented yet, but check out these real-world options that can at least make you feel like you're in the Wes Anderson-iverse. Cafe Congreso, a coffee shop in the Philippines, looks totally Wes Anderson-ed out with its seafoam and pink interior and its retro-style technology. Another super pink one: the Nanan Patisserie in Wrocław, Poland was featured on accidentallywesanderson, a whole Instagram account full of Wes Anderson-style locations. 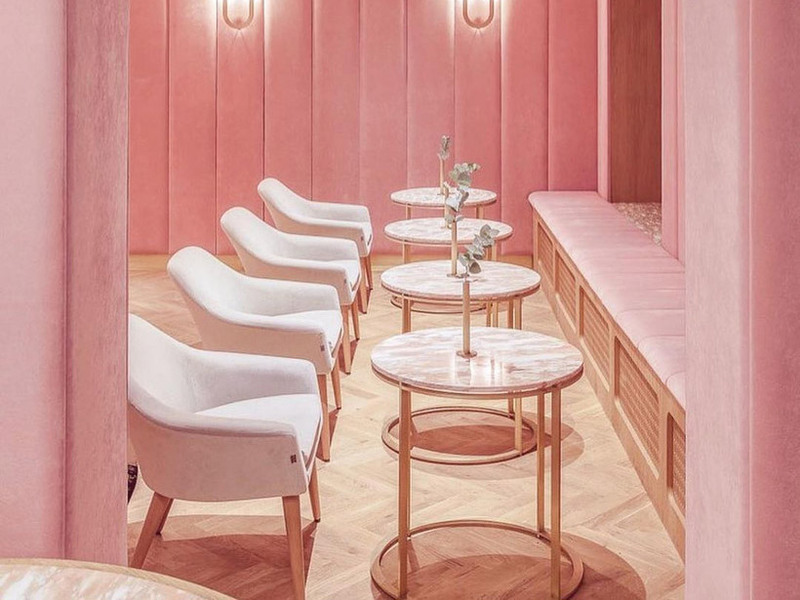 Yep, there's more pastel pink overload, with Sketch London, a "destination place, for food, art and music" in Mayfair, London. Bonus Anderson points for the quirky sketches all over the walls. For a very different, but still bright and off-beat, color scheme, check out the Ladurée macaron company's restaurant on Geneva's Quai des Bergues, with its bright greens and purples and checked floors. The bar at the Graduate Hotel in Oxford, Mississippi, with its hanging globes and rows of under-the-table books, looks like the perfect date spot/runaway destination for Margot and Richie Tenenbaum. Meanwhile, the Aquarium-Café on California's Manhattan Beach Pier looks so Life Aquatic-y that you'll probably be surprised if you don't run into Steve Zissou (or at least a member of Team Zissou). Speaking of aquatic, Seoul's Style Nanda Pink Pool Café doesn't just look like something out of a Wes Anderson movie. The whole concept is surreal enough to be straight out of a Wes Anderson script: it's a pink and blue café with an actual little pool in it. Plus, there's even a bit of fox wall art in the hotel to take you right back to Fantastic Mr. Fox. Sure, the interior of Mel's Diner in Bonita Springs, Florida is fairly Wes Anderson-y with its retro style and bright colors, but it's the striped, turquoise, super-symmetrical exterior that really does it. The festive season means lunches, dinners & lots of parties 🍴🍾🎉 Our Repulse Bay location at @thepulsehk will be closed from 6:30pm tonight for a private Christmas party 🎄 Visit our other locations for happy hour or dinner instead! Apologies for any inconvenience caused. At the Repulse Bay Classified in Hong Kong, quirky bench swings, boldly patterned tiles, bright blue windows, and pink-hued weathered wood combine to give off this vaguely Grand Budapest-y vibe. Of course, for the most Wes Anderson-y eatery of all, there's Bar Luce, the actual Wes Anderson-designed bar in Milan, with its pastel toned seats and its Steve Zissou pinball machine. It's about as close to being in on of his movies as you'll get without an audition.